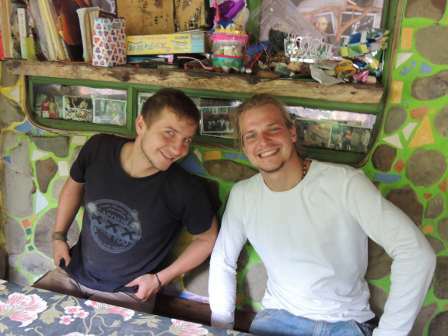 Oliver(Germany) and Martin(Poland) they were only clean for this foto otherwise they were busy working all of February and March 2013 on many many projects! Amazing help! 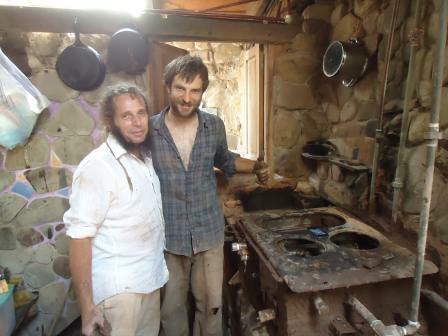 Sebastian and I rebuilding the oven that cooks and bakes everything we eat! thank you Sebastian for your incredible help in January 2013! ever try in your life! 1) to learn: since we do things in an way that is mostly unknown in our society today Ginger's Paradise is like a school to learn about organic agriculture, permaculture, arquetecture, masonry, water supply and water systems, generating electricity in ecofriendly ways, cooking on woodfire, cooking with fresh vegetables, spices, grains and much more. also learn life philosophies, art and music! work is usually in the garden areas and it is not light or easy on the hands most of the time. 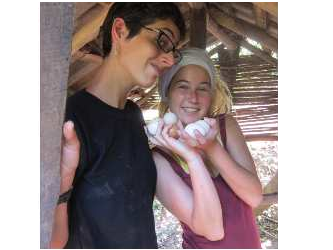 learn to milk a cow, make yogurt, cheese and dulce de leche! in less than 2 weeks you can become a master milker! Now we offer the possibility to work in a fulltime volunteer position! *To have a very good understanding of gastronomy and know how to cook for sevral people. *To have at least one month available to dedicate to said work at Ginger's Paradise.